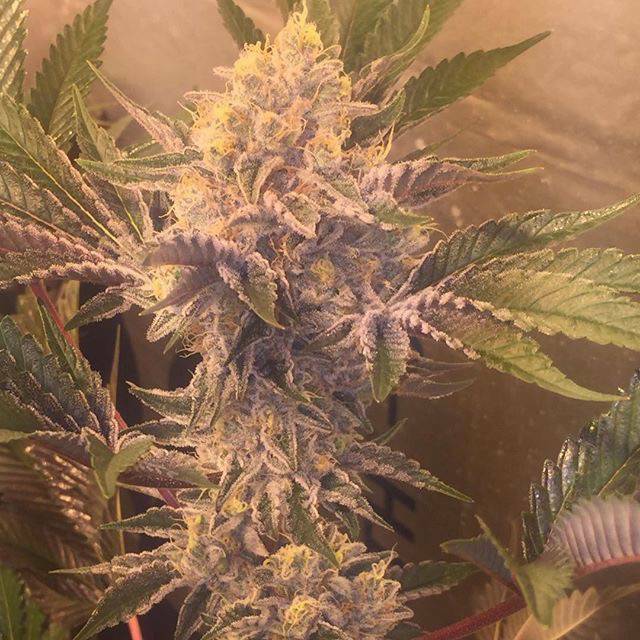 Stardawg 3 x Banana Kush utilises the orgnkid's male F9 Banana Kush to pollinate the rare purple pheno-type of Stardawg 3. It is a colourful indica/sativa hybrid strain with the potential to realise staggering amounts of THC. It is useful as a medicinal marijuana strain and boasts a deliciously captivating range of flavours. Stardawg 3 x Banana Kush is suitable for cultivation in all growing environments; flowered indoors it will need 8 - 10 weeks to be fully mature for harvesting. Outdoor-cultivated plants will be ready to harvest either in late September or in early October in northern latitudes. Yields have the potential to be very large with some pheno-types producing enormous resin-covered colas of very high THC buds with some (Purple Stardawg pheno-type) recording as much as 30% THC! Aromas and flavours will, of necessity, vary according to pheno-type; some plants exhibit sweet banana peel flavours while others have an assortment of Chemdog/fuel or incense, coffee and Skunk qualities. THC production varies from 21% - 30% with CBD between 0.1% and 1%. The general effect is that of an indica stone complemented by a cerebral, sativa hit. Therapeutcally Stardawg 3 x Banana Kush is recommended to treat the symptoms of pain, insomnia, nausea, post traumatic stress disorder, stress and for treating cancer patients via Rick Simpson Oil.